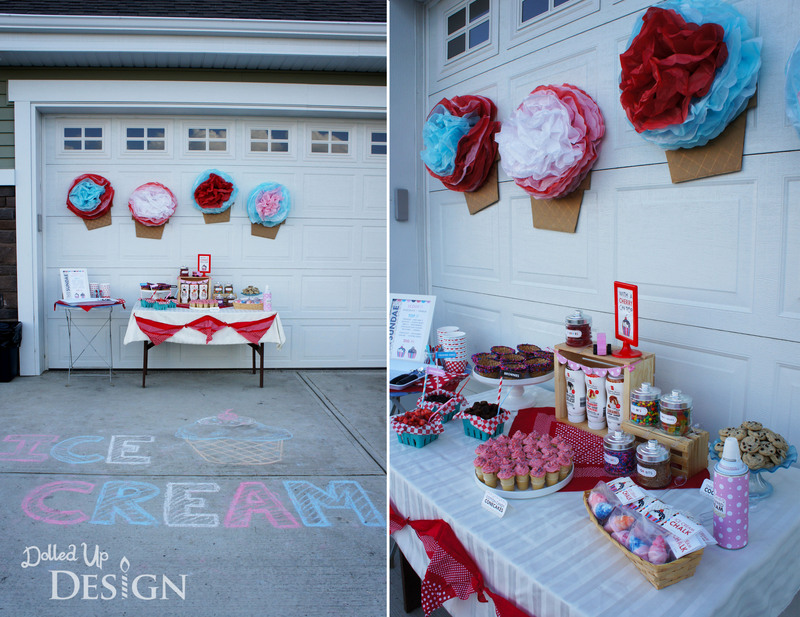 Are you planning a Mario themed party? 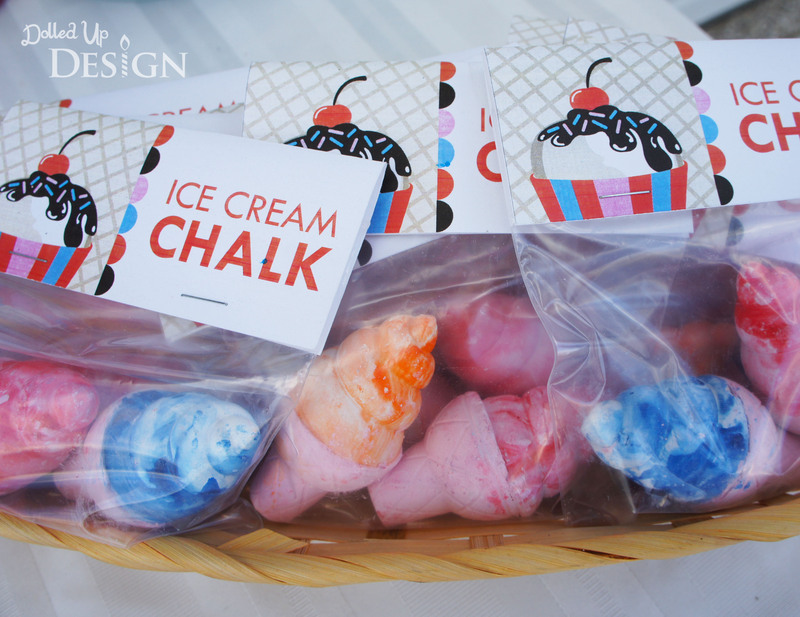 These adorable treat filled mushroom favors are enough to excite any Nintendo-loving fan. 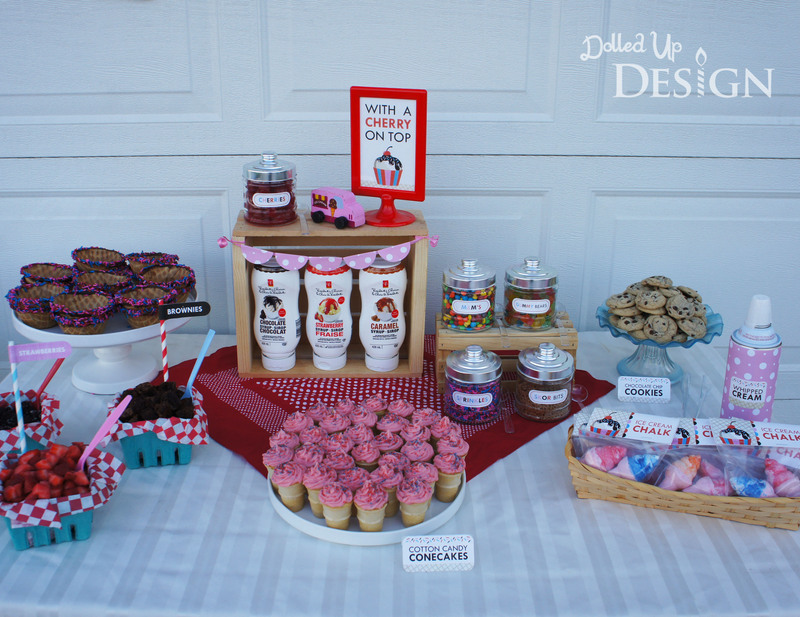 Check out the full DIY Mario Mushroom Favors tutorial as my guest post over at Moms and Munchkins today. We have been in our new house about 6 months now and while I adore our beautiful new house, it is the neighbourhood that I have really fallen in love with. We are in the perfect little cul de sac filled with young children. Most of our summer has been spent with the kids running around outside and getting beyond dirty while playing with the neighbour kids. Camden loves all his new friends and the older kids have all been amazing with little Keira. We have met all the neighbours individually, but I really wanted to do something that got everyone out together and socializing at once. Since we, and the other neighbours, all seem to plan to be here long term, I want to try and foster these relationships and keep things as positive as possible between us. 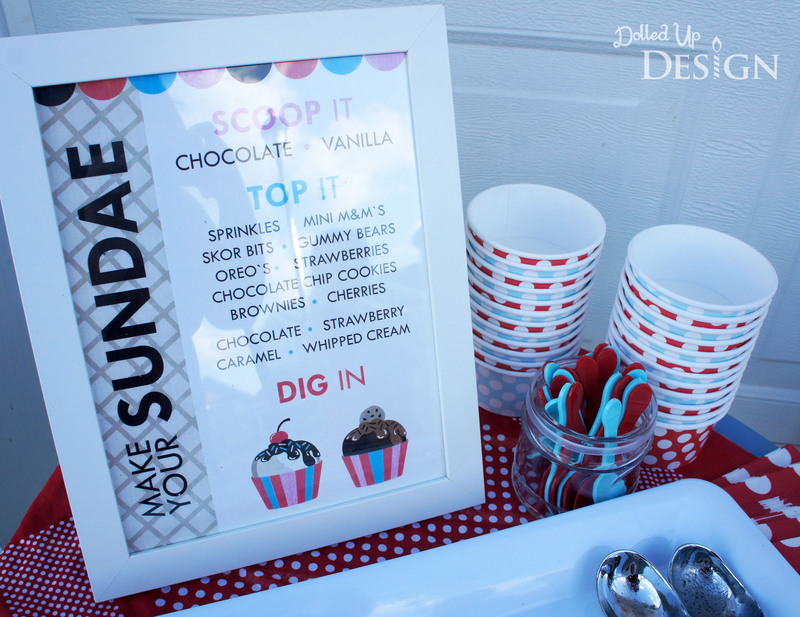 The typical block party potluck and barbeque seemed like a lot of hassle and I do love a good sweets table, so I came up with the idea of hosting a small Ice Cream Social right on our front driveway. To begin, I designed some cute invites I could print off at the Walmart photo centre as 4×6″ photos. 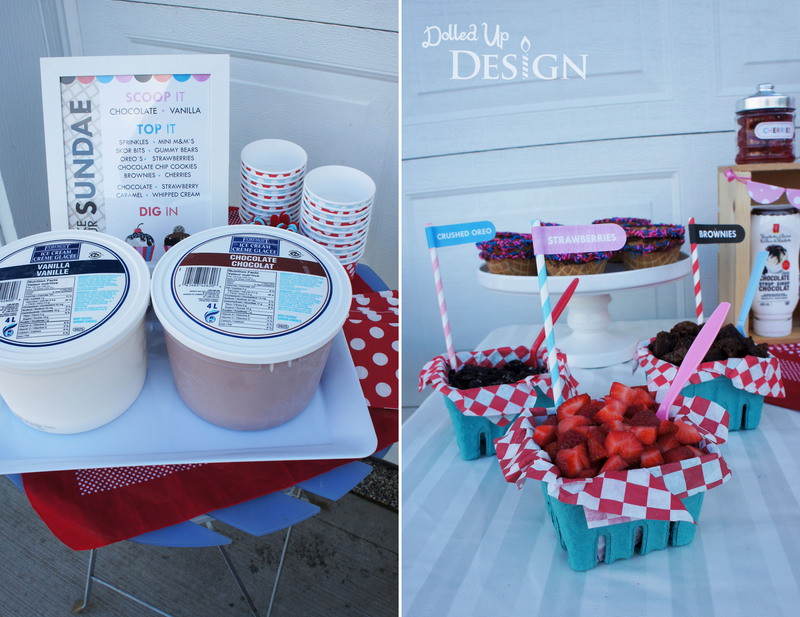 I had already bought some paper sundae cups in red and blue so I decided to use that as the beginning of my color scheme for the invites and the party, adding in touches of pink and chocolate brown for accents. I chose to have it on a weekday evening since most people tend to be busy during the summer weekends. 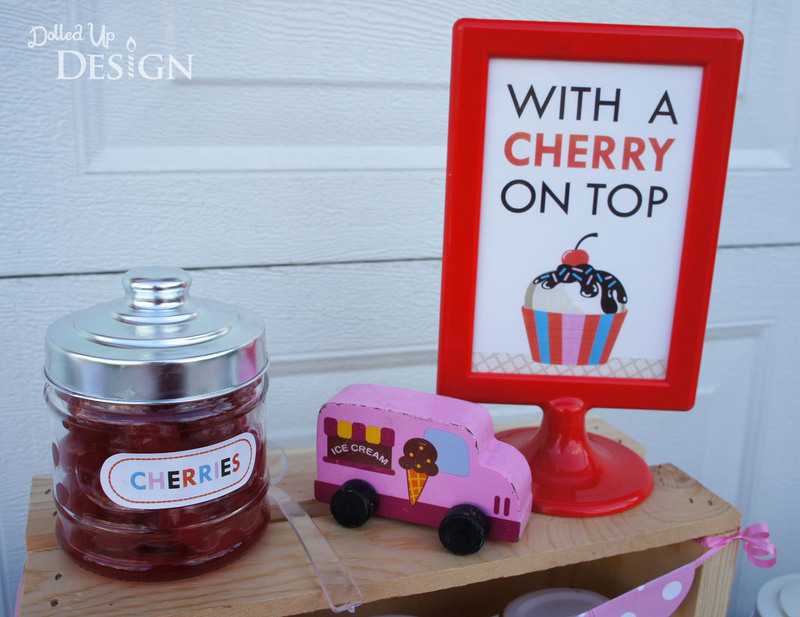 Other printables I ended up making included a couple framed signs for the table, stickers for the topping jars and paper toppers for the chalk favors I made up for the kids. 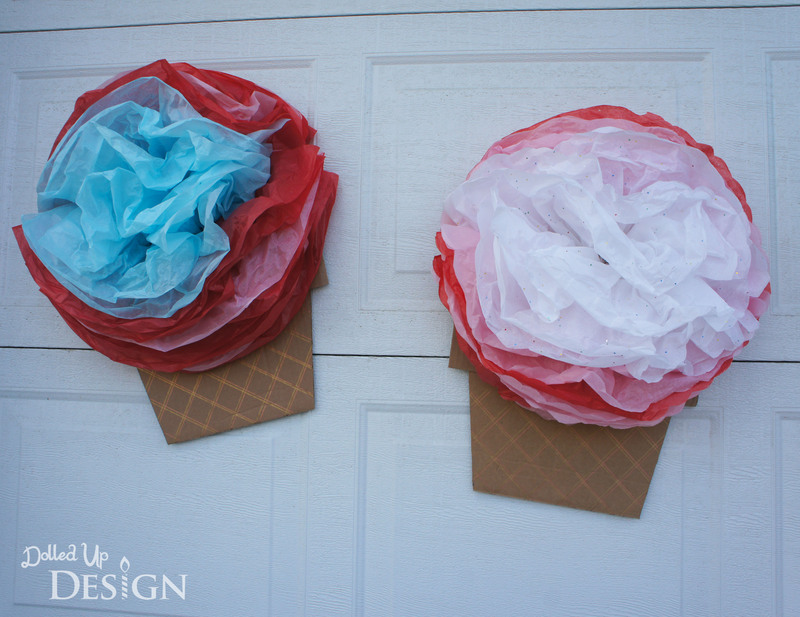 I wanted to keep the decorations cheap and simple so I made up some quick tissue puffs in the party colors and added cardboard waffle cone bowls to make them look like sundaes. They added a fun touch to our garage door and helped make the driveway festive. I was also kind of proud of my brilliant idea to hang the decorations using magnets hot glued to the back of each one. 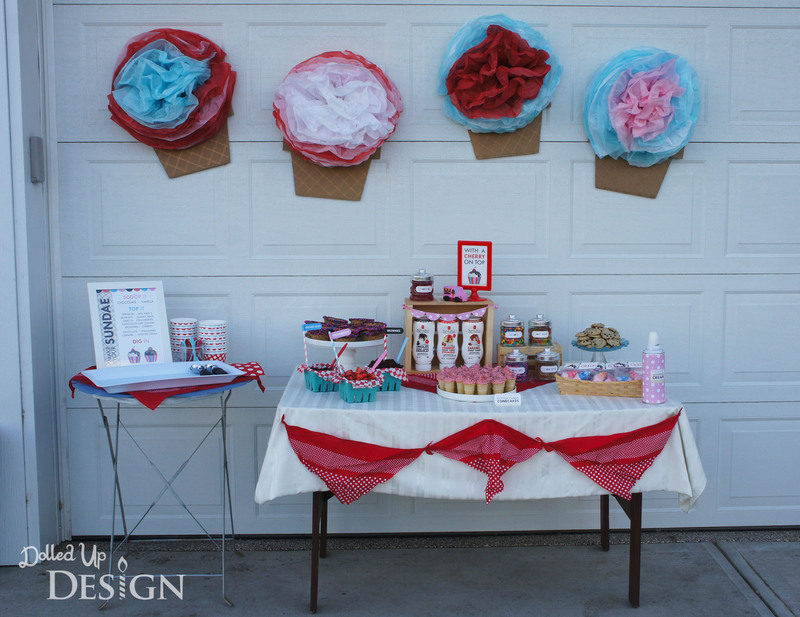 This made it easy to throw them up right before the party and take down right afterwards. To try and keep party costs down I looked to the closet full of supplies I have amassed from other parties. 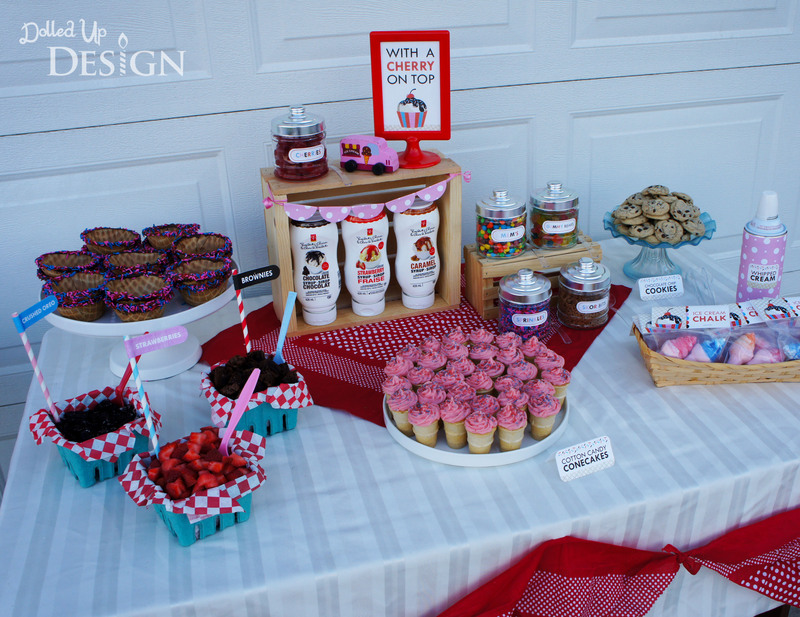 The picture frames, crates, tablecloths, cake stands, trays, jars and berry baskets were all items I had used on previous sweet tables and was happy to find use for again. 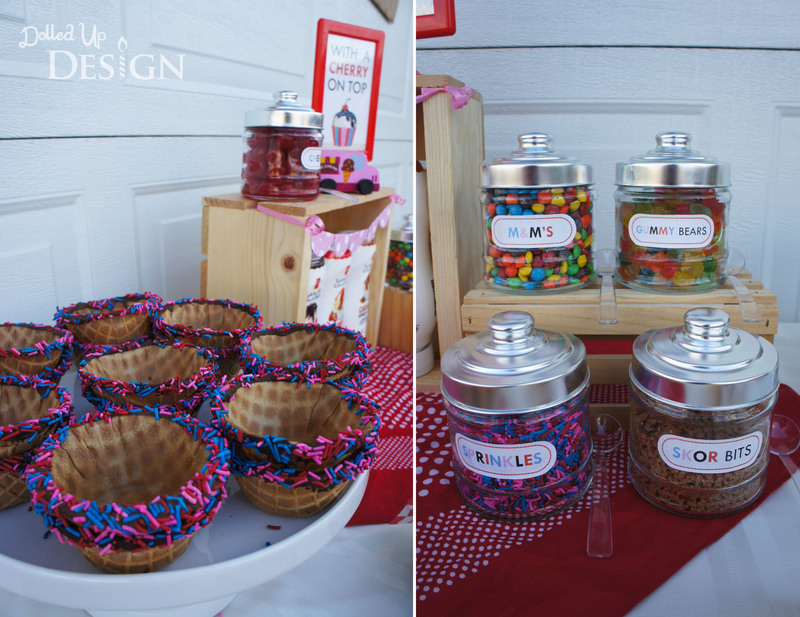 I wanted to offer a wide variety of toppings so that there would be a little something for everyone. My final menu included chocolate and vanilla ice cream, sprinkles, mini M&M’s, Skor bits, gummy bears, crushed oreos, fresh strawberries, mini chocolate chip cookies, brownie crumbles, maraschino cherries, whipped cream, and three types of syrup; chocolate, caramel and strawberry. 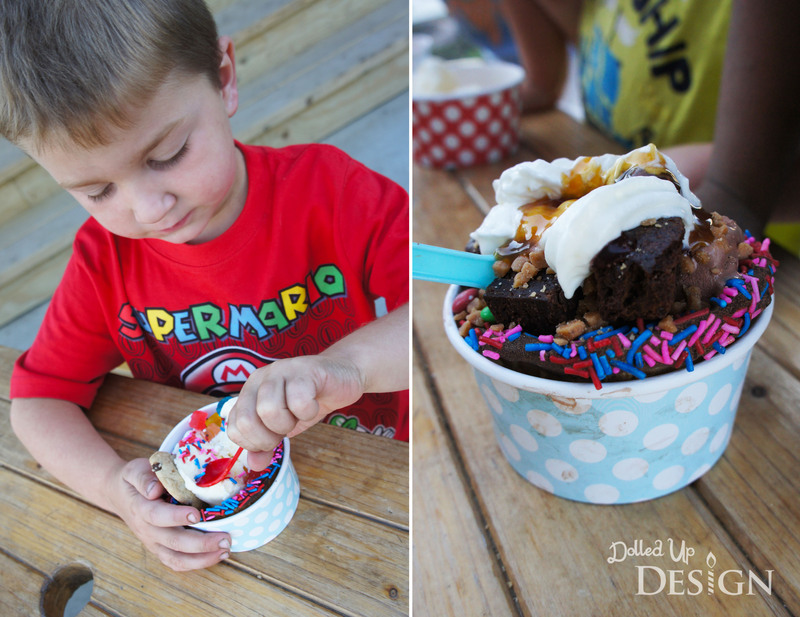 The kids favorite by far was the mini gummy bears, but I think they all tried to cram a little of everything into their tiny sundae bowls. Most of the toppings were bought at the bulk foods or grocery store, but I did decide to also do a bit of baking. When I found these Chocolate Chip Cookie Bites from Cooking Classy, I knew they were too cute not to have on my table. 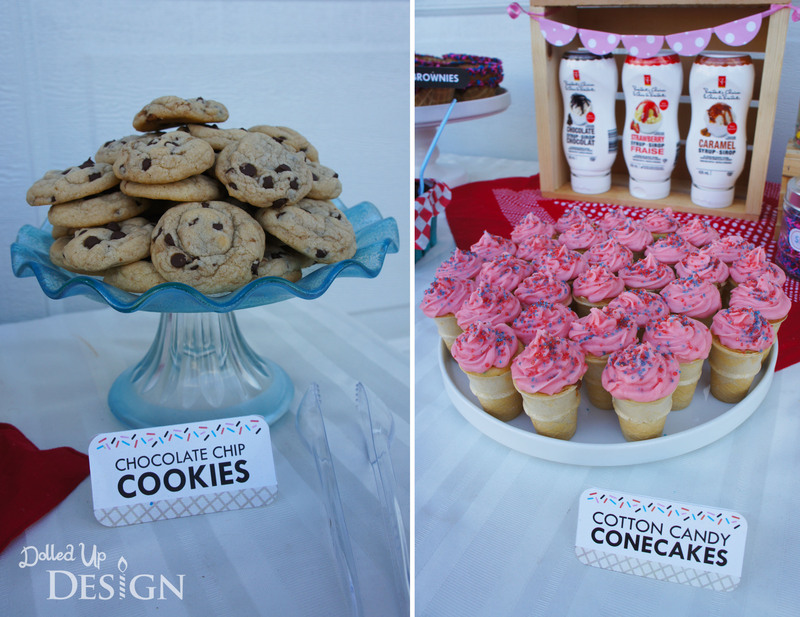 The cupcakes baked into mini cones are something I have done in the past and knew would be a cute addition to the table. I simply poured confetti cake batter (prepared from a box) into mini ice cream cones and baked as I would a mini cupcake. They were frosted with homemade buttercream I flavored with a packet of Cotton Candy flavored Duncan Hines Flavor Creations. It was a perfect evening. The adults all seemed to have a good time and I know the kids loved every moment of it. Most of them were around outside as I was setting it out and were counting down the minutes until 7:00 when they knew they could dig in. Once the kids were happy and fed, they took off running around and the adults were able to actually sit and enjoy a conversation. Some of the neighbours had just moved in so it was the perfect opportunity to really get to know them and introduce them to everyone else in the cul de sac. My 4 year old was beaming with pride earlier in they day as the kids all discussed coming over to his for an ice cream party and he had a giant grin that evening as he sat between his two friends enjoying his sundae. I know a lot of people don’t think they notice or care about all the little details, but they are all part of the overall experience that makes it special for the kids. To see the joy in my kids and everyone else’s face is all I needed to confirm that my little bit of effort was worth it. 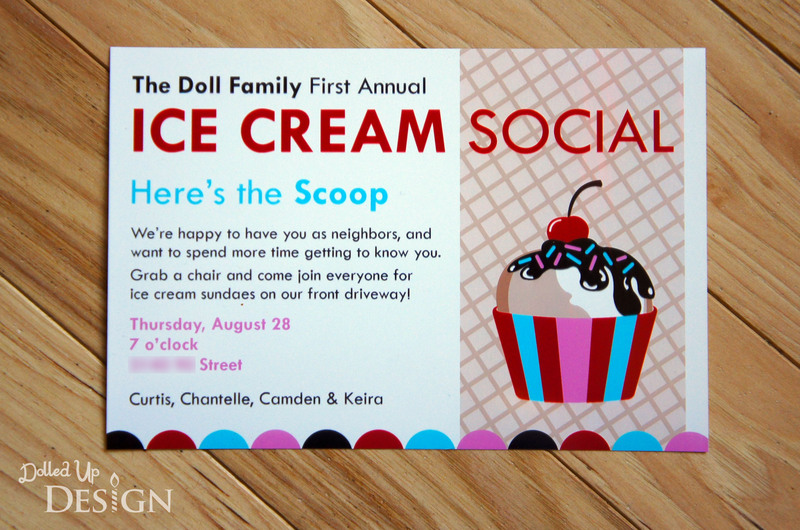 This was an easy party to pull together and I highly recommend hosting your own ice cream social if you are wanting to do something to get to know your neighbours better or want a fun idea for a playdate or birthday party. 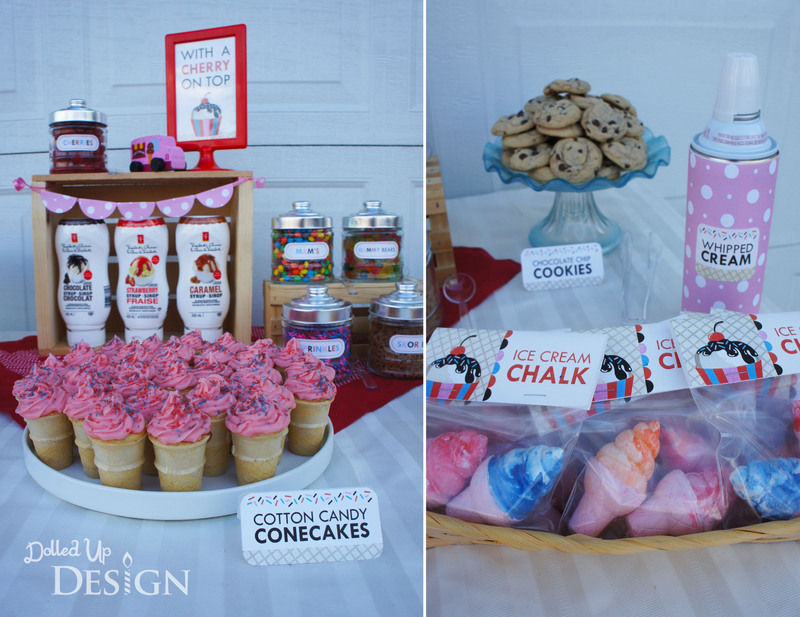 If you hop on over to Moms & Munchkins, you can find tips I have put together for How to Host an Ice Cream Social and it evens includes a handy supply checklist based on the items I used here. 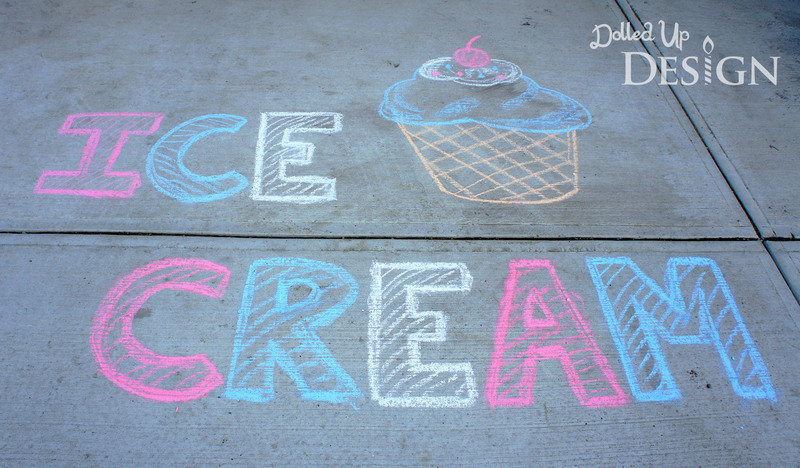 I am already in planning mode for next year and am continually adding ideas to my Ice Cream Party Pinterest board. If you have any great ideas, please feel free to share win the comments below!